I am not even sure if there is any such thing as WordPress Sidebar Etiquette but I know that the WordPress sidebar on your website is very important. The thing is, I see people abusing their sidebars and cramming them with irrelevant junk. WordPress makes it really easy to drag and drop widgets into your sidebar and this can be both a blessing or a curse. It is a blessing when you stick to WordPress sidebar etiquette, but it is a curse when you break all the rules that I am about to show you. Hopefully if you are a sinner then you will be able to brush up on your WordPress sidebar etiquette and reform yourself. I was reading this article about blog design that gave me the idea to write this post about WordPress sidebar etiquette. As you know I like to ramble on and cover the absolute details so you better get comfortable! How Important is Your WordPress Website Sidebar? I would say that your WordPress sidebar is one of the most important aspects on your blog or website. We all know that the sidebar usually shows up on every page and post of your WordPress theme. Of course this depends on which WordPress theme you use. Some premium WordPress themes let you choose which pages and posts your sidebar shows up on, but nevertheless it is an important part of your website. Or you might want to add a WordPress plugin to control sidebars and widgets. Here are a few WordPress sidebar etiquette tips that I have made up myself. There is no obligation to follow these tips as every website is different. All I want to do is make you aware that WordPress sidebar etiquette does exist. Hopefully you can develop your own rules for your own website. Most of my affiliate sales come from in text links and sometimes a highly targeted 300 x 250 banner in amongst the content. The WordPress sidebar is not a major moneymaker and you shouldn’t be plastering your blog with too much advertising there. People often try to help their website visitors navigate through their website. This should not be done by placing 1 million links in the sidebar. You should have a navigation menu at the top of your website, where a website visitor can easily access different categories all sections of your website. Everything you have should come under these categories. Webmasters who place too many links in their sidebar are really confusing their website visitor and not helping them navigate through the website at all. Not only that, you are leaking good PR juice to pages and posts that may not need or deserve it. Take a good look at the pages that link from your homepage. They usually have a page rank of one below the home page because that page is passing on authority. For example this website has PR 4 and links from this page get a PR 3. I often visit peoples websites and notice that they have irrelevant advertising or information in their sidebars. For example, I went to a local news website which showcased local news and community events for a particular town. In the sidebar I saw links to affiliate programs for making money online. These people have come to read the community News and have no idea about making money online. If these links were on a website that was in the niche for making money online, then this would be passable for WordPress sidebar etiquette. WordPress widgets are the easiest things to use as most of them are drag and drop. This is great but not when you are WordPress widget happy. All you have to do is basically choose a widget and drag it into your chosen sidebar. You can see the screenshot below showing how easy it is. Because this process is so easy, you will need to control yourself in this area. Take a good look at your WordPress website and see if you are using WordPress sidebar etiquette. Social networking is huge but do we really need all of those social networking buttons. Should they really be taking up all of our valuable website real estate? I think not. This will stir up some conversation as it seems to be the normal procedure to put social networking buttons at the top of your WordPress websites sidebar. Of course I am guilty of this on some of my websites, however I have been testing this and I do not believe it is necessary to have all of these buttons in such a prime position. How do I know this? I went to Google Analytics and used the In-page Analytics feature. You can find this option under the content menu in Google Analytics. This is one of many basic Google Analytics tracking tips that I use often. The screenshot below shows my in page Analytics which shows a percentage of clicks that a link will get. As you can see in the sidebar, some of the links do not get clicks at all. This is how I know that my social networking links were not worth putting in the sidebar. If you look around my blog now you will see a simple Facebook like button in the sidebar and an RSS subscription box in the footer. When you actually go into each individual article, I have various social media buttons to enable people to share my content. This method is working for me. I still get followed on twitter and re-tweeted, but this is through my content. If you have read through all of these points mentioned above, then you might realize that you do not need too many WordPress website sidebars on your website. I am a great believer in the K.I.S.S (keep it simple stupid) method and having too many sidebars, or too much in your sidebars is just overkill. I do have websites that have two sidebars but I always make sure they do not have too many items in them. These have been made for design purposes only. I still stick to my WordPress sidebar etiquette rules when feeling my sidebars with information. WordPress Sidebar Etiquette – What you Should Have? When people visit a website or blog, they want to know the person behind the scenes or in charge. Even massive websites made by big companies have showcased their employees who run the blog to make sure they have a personal touch. You need to connect with your website visitor and having an about me section in the top half of your website is a great way for them to get to know you. I will be doing this but I haven’t got around to taking a nice photo as yet. 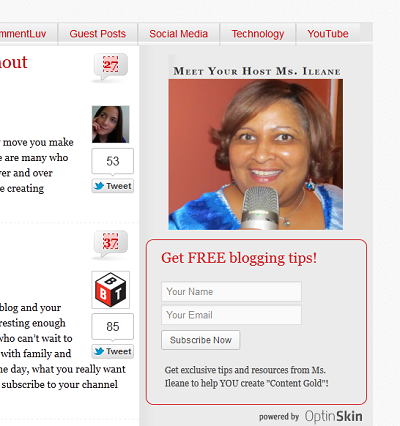 A great example of an About me in the top of the sidebar is at Ileane’s blog called Basic Blog Tips. This is a perfect example as people immediately feel a connection with Ileane. We can look at the screenshot above again. You can see that Ileane has an optin box as the next most important item in her sidebar. I agree with this, even though I did post this article titled “Do you really want to be on my list?”. I agree that an optin box is important but I also think that you need to engage your subscribers quickly and work out what they want. There are a number of factors that cause a website visitor to sign up or subscribe to your list. If you have fantastic content they will probably search around your blog just so they can subscribe. That’s actually the kind of person I want on my list, however having a sign up box in the top of your sidebar has definitely proven to gain more subscribers. I have noticed, when investigating my in page Google Analytics, that my popular posts do actually get clicked on. Of course they are popular for a reason and obviously the titles can attract more clicks. If I compare the clicks I get on a recent posts widget, the popular posts wins hands down. I think this is because the recent posts are available on the homepage anyway. As you can see I only have my popular posts showing on this website, whereas on others, I might have the recent posts showing as well. You need to test what is best for your website. I like to have one banner and possibly a few links in the sidebar. As I have stated before, when making money online, most of my sales come from in content advertising. Therefore I am only adding a banner to the sidebar for design purposes. Having the same sidebar widgets for your homepage, your pages and then your posts can be down right silly. These different pages sometimes call for different content in the sidebar. For example, showing the recent posts in the sidebar on the homepage is overkill when you have them showing as an excerpt anyway. But showing recent posts in the sidebar of other posts is not such a bad idea. If your theme does not allow you to manipulate your sidebars you can buy a Sidebar and Widget manager plugin to help you customize these areas. This is a smart way to show the right content for the right page which reduces bounce rate and gives the reader what they want. I would really love to hear everyone’s opinion about my WordPress sidebar etiquette article. Do you agree with me when I say that we should “keep it simple” and not clog up our WordPress website sidebars with junk? Hi Mitz!Great informative article presented by you.According to SEO rules, a website/webpage must have 8 Ads for a webpage which includes 3 Banner Ads and 2 Link Ads.If we maintain like this,Our website’s PR also increases.The website must be simple and not heavily stuffed with ads is the key point to make.Thanks for your opinions on the sidebar. I used to like having 2 sidebars on my blogs because it used to be the in-thing before. But then you realize that there’s not much use for one of them and its just cluttering the blog overall. It also drives readers away. Nice post and Yes, sidebar is one of the most important factor of our blog design and we have to used it very carefully. I really like the idea of inserting About Me in sidebar. Very well put! Less is more in my opinion. I know there is nothing worse than to see a sidebar (or two) just crammed with ads and banners and adsense and so on! If it looks like an advertising wasteland, not only am I not clicking on anything, I probably won’t go back to that site again either. It’s like walking into a store and being bombarded by sales people. Will you go back to that store? Simple is the way to go. Don’t just add stuff because it looks cool. Add stuff because it looks good and is functional. Also a picture of yourself in the sidebar is almost always a given. People want to connect with the owner of the website. I’m thinking of creating a little YouTube video to put in my sidebar welcoming people instead of text and a picture of me. Yes you are right David, people want to see who owns the blog! A Youtube video would be even better! Many bloggers put a lengthy list of previous posts as popular, recent, feature and bla bla just to decrease their bounce rate but they foreget the fact that this does offer navigation; the actual way to hold on visitor is to put quality contents and put the list of categories on top bar. Yes totally agree with your points. We should provide quality content and it will surely decrease the bounce rate. Yes when you will go with social media then you can see how result will come out in favor of you because if you are involve in online marketing then you should have multiple accounts on most important social media sites because from there you can convert good number of traffic for your site/blog and you can create your social network as well on it. We should use our sidebar carefully as it is very important part of a blog. Yes I agree with your points that people mostly fill it with irrelevant things that’s not a good idea. Agreed! And since Google’s Penguin update any blogs stuffed with sidebar (and/or footer) links have been severely penalized. I’m a little guilty of having ads in my sidebar, but they are highly relevant to the sites general content so works well for me. Have a great day! Ads can be there in sidebar. But filling sidebar in excess is not a good idea. So we should avoid these types of activity. Thanks Ileane for sharing this info – I’m getting ready to move a Blogger blog to WordPress so this is perfect timing. I will try not to clutter my sidebars. I do have a question on the share buttons – are they better on the side or under each post? I tend to like under the posts but I see you have them on the side – is there research that has been done on that? You have great site from which I can learn so much, I have a question. Which wordpress template is best for SEO, and adsense,. I am newbie here found your blog very informative. Thanks for these great shares. there are different themes that I would recommend depending on your skills..
Socrates for beginners is the best for Adsense and SEO. Thesis for people who know how to code a bit.. Thesis 2.0 for even more advanced. See this article reviewing them. Great WP sidebar etiquette tips ….Agree with you that if the amazing drag n drop feature in wordpress used wisely, it is truly beneficial else its a curse ! Who doesn’t? I mean the sidebar is such a good place in our blog to put stuff that we want. And when putting elements or widgets in it, its hard to really realize at first if what we are putting is valuable or not. For me, the only time where I realize its not worth it is when planning for a redesign w/c happens yearly on my other blog. good thoughts, I always try to keep my Sidebar ‘quiet’ and ‘clean’ by using only the 125-Banners and with a rotation-widget I can adjust the number of banners shown, while still having all I promote in there.But also often have the problem having too much possible widgets and must try to find the right combination – but I also think less is more. I never thought about the sidebar having too many links before. I always thought having more catchy titles in the sidebar will show that the site is content packed and would give readers other interesting things to look at. I guess it does make sense that too many links might just confuse the reader who will then bounce from the site. How many links in the sidebar would you consider as too many? I always like to take a minimalist approach to designing my websites. The less clutter you have the better the overall user experience is going to be and the more likely they are going to stick around. There is such a thing as information overload where if you are presented with too much at one time, you can’t really process any of it. Thank you for the great reminder – I get “widget happy” because I have a hard time knowing what to put there. I really like the sample you put in your article for “Ileane’s about me and optin box”! I’m guilty of being a sidebar tinkerer (if there is such a word). Recently though I think I’ve reached a place where I’m relatively happy with my use of sidebars. It’s far too easy to go over the top. I’ve tried more than one side bar, one of the right, one on the left, but this doesn’t leave enough space in the middle. Two side bars on either the left, or the right, seems to look cramped on my site at least. Some sites pull it off, but in the main it’s just too much information on one page. It’s hard to quantify what layout is best though. I think I’m talking myself into a re-design. Oh no! Great list of widget for your sidebar! I believe that organizing your sidebar is important especially if you want to maintain the simple look of your website. In that way, you could also maintain the interest of your visitors. Lol, “widget happy” is the best way to describe how I used to be. I used to add in at least 8 widgets there mostly the categories, calendar, recent posts, facebook box, twitter box, youtube video, pictures (to make my blog pretty), and so on. Now that I have learned better I try not to cram too much stuff on the sidebar. I also before sidebars that are on the right. IMO, content is what people are looking for so that should be what is on the left side where people check first. I agree that the popular posts widget is best. However, I prefer to put a text box, label it “popular posts” or “top posts” and add the links myself rather than rely on wordpress to do it for me. Is this also apply for AdSense ads? or just affiliate sales? Any way, thanks for sharing. This is a great tip for me. I should reorganize how and where to put my AdSense ads. Jeah, the “how to fill up your website” is a true sceince 🙂 Thanks forthe post, really useful! Another sidebar tip is to create custom sidebars for different sections of your site. This way you can include tailored content based on the blog categories/web page content. I do this with decent success. There’s a custom sidebars plugin that works great. Just don’t forget to select your desired sidebar in the “add page” or “add post” visual editor page. This is particularly good for list building if you have more than one list or several incentives targeting different groups. Peter which one do you use. I tried one and I couldn’t get it to work. When I use StudioPress themes, I use their Genesis Simple Sidebars plugin. Thanks for that info – Elegant Themes is next on my purchase list for my next site which will hopefully be the Easter project – but I was wondering if anybody knows of one that you can use with other themes. Great Post. Very informative. This information should save many brand new internet marketers from making the common mistake of believing all the mis leading get rich quick schemes that are being advertised all over the internet. It is refreshing to read honest internet marketing information instead of all the false promises that so many blog posters write. Very nice post Mitz, I also tend to keep my sidebar clean and as professional as possible. I have seen people adding all sorts of social networking widgets in their sidebars, it not only look unprofessional, ugly but also it makes your site load a lot slower. Hope some of the people will learn something from your post and start using only very important stuff in their sidebars. Me as a reader many sidebars could be really confusing. I prefer simple WordPress website sidebars because it is friendly to my eyes. Thanks. I definitely agree with your point! Blog owners should only use those widgets that are useful for our readers. This not only deter the usability or function of your blog but it also look messy and cluttered. I have never thought of this. I think that this could even apply to a non-wordpress website. You don’t want it to get too cluttered. I would just say to just create another webpage if you want extra stuff. You want your visitors to stay on your website a little longer. Great Post Mitz, I really love blogs with a Clean blog sidebar and You are really right about Ileane’s blog, she inspired me to add my image to blog sidebar. Great post with a lot of useful tips! Thank you for writting it. I really liked how you showed your stats/percentages of click on the homepage. I’m definitely going to have a look ever my own side bar and hopefully clean house. Nice tips! Like a lot of people, I get out of control when given so many new shiny things to play with. 🙂 I like your thoughts on etiquette. No doubt that the Sidebar is very important in a WordPress blog. I make changes to my all the time. It is always a matter of putting your best information in the sidebar, but not too much. The more important you think it is the higher up I put it. I also use Google Analytics In-Page analytics to figure out what people actually is clicking on to figure out what is working and what is not. Lisa recently posted..Do You Know What Time It Really Is? Hi Mitz Really awesome. After reading this article i came to point that i am also breaking the rule. But soon i will change my theme and will implement your rules. Thanks a lot for sharing with us. As always some great resources you share with us. Really its great post thanks for sharing. I always use a widget to my blog. I put a widget that I consider important. But, my blog looks even more dirty. How do I fix this? Hey Mitz, how cool of you to give me my 15 minutes of fame here in this post. LOL! Now about the sidebar and Google Analytics. I started looking at the in-page analytics features recently too and I find them really helpful. One thing I’m confused about is this. When looking at my home page the percentage of clicks I’m getting on recent posts listed on the sidebar is exactly the same as the post links themselves. So I can’t really tell if people are clicking on the sidebar link or the post link. Any thoughts on that? Again, thanks so much for the shout out and the awesome post! You could also try to use a 301 redirect for one of the two similar links. I don’t know how google analytics reacts to this, and it’s probably not ideal seo-wise but it will give you a clearer picture of what readers click on. OT: I totally agree: Keep it simple! The viewer distractions you have on your pages, the better you can focus the readers on what you want. i only prefer categories, link ads and popular posts in site’s sidebar because it works as a small popular sitemap for my site and it does not looks messy at all. i appreciate your post because no one cares about sidebar. i read this type of post for first time. so thanks a tons. Wow! i was listening to the WordPress-websitebuilder.com on the link you provided and this really sounds like something that might help me. Would really appreciate your advice on this. Great post again and I always learn something new from you. Boy am I guilty of those social buttons in my sidebar.. LOL.. I put those on all my sites and on sites I build for people.. I need to see if people are really clicking those..
and I learned a long time ago about plastering ads in the sidebar.. When I first started, I had like 5 ads in my sidebar.. Don’t think I made much money from them though. I like to put all my links and about me page in my footer. That’s the main reason i changed my theme. the old one didn’t have a footer. I’m a sucker for a good footer. LOL..
You are right Mitz. I think that, too many sidebars are confusing. A plain, clear website, with easy and friendly navigation is enough. The visitor lands a website, searching for something. Even if it’s a product or just information, he must not be disoriented by too many elements in the page. Thanks for explaining the importance of sidebar. WordPress is really made it easy to organize every thing. I have learnt many important thing form this post. Keep up great work. This tips will help in adding more value to blog. You mention that the Google Adsense ad is different. Can you elaborate on that? Do you have more success with Adsense and that’s why you’d place it in the sidebar? I had to look at my sidebar, even before finishing this post. I need to add the about blurb and maybe take out one ad. I don’t see a lot to fix on my site, but I can also attest that sidebars aren’t the big money maker some might think they are. I couldn’t agree with you more. I have seen some sites where it gets really out of control. Great tips for reducing the nonsense. excellent way of describing side bar etiquette ..
First off, i do not even know what “etiquette” is, I am a city boy! LOL Do not tell me you are getting out of the Social Media Game now. I completely get it though, but I do feel they bring some traffic. Despite the fact I am hardly ever on any of them ever since “Business Blogging” and you came into my life. Well if you are getting out of that, then that means you have time to come on over to my sites..lol Agree that we need to remove the clutter of our pages and sidebars. I do love the idea of having the “About Me” in the sidebar. Such a useful guide about sidebars! I personally hate the to much sidebars, they just destroy the design. I agree that there are must-have once installed on the blog, but the to many ads could riun the trust from the visitor and have a bad look as well. Hi Mitz, Timely post, I am working on redesigning my sidebar and saw the post. I agree many options can spoil the leads and can confuse the readers, I am also trying to make it less clutter and only filled with relevant information. Great observation Mitz, Glad you’ve noticed that and shared it to newbie’s like me! I also agree with Jan’s statement that some newly establish sites fill their websites with links and banner which I think is wrong. Hmmm.. I’m glad you shared this to us! Thanks MItz. Personally I prefer just one sidebar, but there are 2-column sidebars in websites that actually still look good. Good layout and design must’ve helped it. In any case, I think sidebars are a supplementary feature to your website and must not get in the way with your main attraction – your content. After reading this i realized that i am also the one who is breaking the rules….. Nice article Mitz. After reading your post, I agree with you on the fact that sidebars are sometimes are just filled with irrelevant junk. But the etiquette which you have sorted out here are spot on. Even I think I will be using your tips for installing the sidebars on my blog. This will help in adding more value to the blog. Thanks for sharing your experience! This is my first time to comment on WordPress Websitebuilder. Great post, I’m not using many widgets on my sidebar and I prefer to keep only 2 to 3 widgets to not have a crowded sidebar! I like your observation about blog sidebar. This is very helpful to those stuffs that you want to convert into lead. for example you want to increase your social followers you just put our profile icons into sidebar or you want to make revenue from blog you just put your add in sidebar etc. So, this sidebar is the best place for “call to action”. Alok recently posted..What is Travel Insurance? I hate to see when sidebars are filled with ads. What makes them think that I will go to their sidebar and click their ads. It’s ok to have a few but when you have like tons of ads, it clearly shows that the blog is lack of passion and just go for monetary terms. This is a great article. I really like when people mention ways to customize and work with the “native” features of WordPress. Many developers seem to think they need a 3rd party plugin for unique content areas which could easily have used a custom sidebar. I see that even in expensive themes. One last note on why to use “get_sidebar” instead of include is because WP will gracefully default if that sidebar template is missing for some reason which is better than seeing php errors on the page. Excellent tips indeed! I really love to learn from the well experience one.. I have learn a lot from you.. I will always keep that in mind..
Great informative article presented by you.According to SEO rules, a website/webpage must have 8 Ads for a webpage which includes 3 Banner Ads and 2 Link Ads.If we maintain like this,Our website’s PR also increases.The website must be simple and not heavily stuffed with ads is the key point to make.Thanks for your opinions on the sidebar. Thanks for your opinions on the sidebar. It’s tempting to overuse the sidebar just to fill up space, but a lot of what you have to say makes a lot of sense to me. I’m going go to my site right now and revise my sidebar. Annie recently posted..Negative thoughts – are they ok? Hi Mitz, another valuable post here again. I really don’t know about this WordPress Sidebar etiquette and now I know it I will have some try of it. Thanks a lot Mitz! Hi Mitz gret info about what we have in our blog or not…..Popular posts ads and about me yupp essential…….thanks for sharing it………. It is sharebar and it works well. I positioned it there in the settings but it is very easy. I might have a video about it on this site.. I think the article is about adding a Google plus button to sharebar. I think it is a big problem when you are starting out, you absolutely fill your site with links and banners because you so badly want somebody to click on them and buy something! Eventually though you do “let go” and take out the five dozen or so that you have and leave just a few. I have my most recent posts and most popular posts listed in my side bar, and it definitely does help to get some click throughs and comments. After reading your post though, I will think about taking them all out of the sidebar and just leaving them on the relevant post. Hi Mitz, another great post. I am really interested in hearing more about your adsense sites. Just an idea for a future post if you like the thought of it. Thanks for explaining that your out-of-content links get far less clicks, that’s important to know. david recently posted..Taxes: Do It Yourself Or Get An Accountant? What details do you want to know? Hi Mitz, well, I don’t know that you would want to discuss it publicly, but I would like to know things like – can you make a full time living from adsense alone? What have you found to be the best placement for an adsense ad – in the post itself or under the header or on the sidebar? How many visitors would you estimate that you need to see per day to make $200 per day from adsense ( I know it depends on the ads – but generally speaking? Some great tips for wordpress sidebar etiquette. I see many blogs that are breaking these simple rules. The most important one to me is to limit the amount of widgets in your sidebar. Not only does it clutter your page and cause formatting problems, but it also slows down your blog. Also good point about sidebar ads getting much less clicks than in-content ads. That makes sense to me, but some people only put ads in their sidebar and nowhere else.